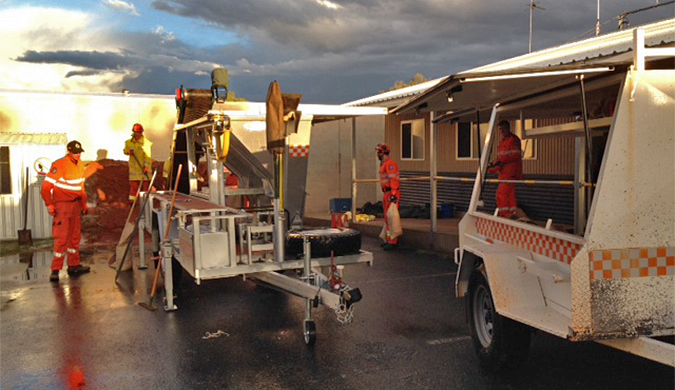 Northern Territory Emergency Service (NTES) volunteers responded to more than 80 calls for assistance during June’s freak hail storm and their response was a testament to their training in community safety. Storm damage training involves learning how to fill sandbags correctly as well as different techniques in water diversion and containment. Volunteers learn how to operate water pumps to remove floodwater, working at heights safely under emergency conditions to tarp storm damaged roofs until a contractor can make permanent repairs. Trained in chainsaw operations, the team is also able to assist with the removal of fallen trees. Courses in shore-based rescue boat operations provide volunteers with the skills needed to rescue people in flood waters without putting themselves or others at risk. The Emergency Management Training Unit (EMTU) is also training volunteers for a broad range of tasks within an Emergency Operations Centre. This significant initiative will provide emergency service workers and key stakeholders across the Northern Territory with the necessary training to manage emergencies and disasters whenever and wherever they occur in the Territory. Interested in becoming an NTES volunteer and helping out in your community? Email ntes@nt.gov.au or call 8951 9300 for more information.